Watch the on demand archive presentation by clicking the link below. The resources for this presentation, including handouts, are listed below the presentation archive. Do your students' grades accurately reflect the extent of their learning? Do your grading practices contribute to students’ motivation and success? 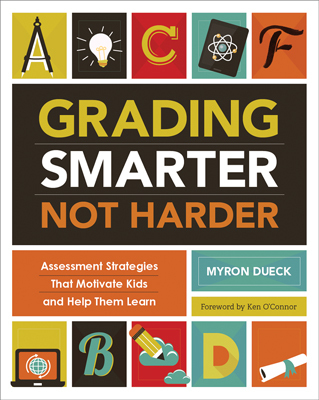 Join Myron Dueck, author of the ASCD best-selling book Grading Smarter, Not Harder: Assessment Strategies That Motivate Kids and Help Them Learn, for a thought-provoking webinar that will inspire you to look at how you might improve your grading and assessment practices. During this hour-long presentation, Dueck will address homework, alternative assessment, eliminating late penalties and zeroes, and the I Know I Am Close multiple-choice approach. Myron Dueck is a vice principal and teacher in School District 67 in British Columbia, Canada. He has previously taught in Manitoba and on the South Island of New Zealand. Over the past 17 years of teaching, Dueck has had experience in a variety of subjects ranging from grades 3 to 12.